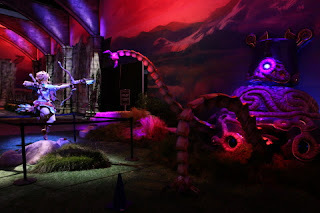 While The Legend of Zelda: Breath of the Wild is clearly the star of Nintendo’s presence at E3, Nintendo Treehouse: Live also gave Pokémon fans something to go wild about this morning: the world premiere of live gameplay fromPokémon Sun and Pokémon Moon, the seventh, and newest, era of the core Pokémon series. The games*, made for the Nintendo 3DS family of systems, include new Pokémon, a new Pokédex, a new region and a new battle format to enhance the Pokémon experience in almost every way. Anyone who wants to keep tabs on Nintendo’s activities at E3 from afar can keep an eye on Nintendo Treehouse: Live at http://e3.nintendo.com, or on Nintendo’s YouTube or Twitch channels. The final day of Nintendo Treehouse: Live begins at 10 a.m. PT on Wednesday, June 15, and will primarily offer a showcase of previously announced Wii U and Nintendo 3DS games, including Tokyo Mirage Sessions #FE (June 24), Monster Hunter Generations from Capcom (July 15), Paper Mario: Color Splash (Oct. 7) and Dragon Quest VII: Fragments of the Forgotten Past (2016). Additionally, viewers will get their first look at a new Mario Party game for Nintendo 3DS that includes additions and changes to make it much more fast-paced and portable-friendly – players no longer have to wait for their turn, as everyone moves at once. Mario Party Star Rush launches Nov. 4.